Home » Health » Health Articles » Does Salt Therapy for Asthma, Allergies, and Sinusitis Work? One of the more popular natural remedies for treating allergies, sinusitis, eczema, asthma, and other respiratory problems is called salt therapy. It’s been popular in Europe for decades now but is only just catching on in the United States. 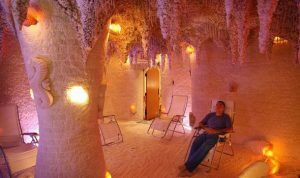 Salt therapy started in Europe through the use of salt caves. These are underground caverns filled with salt crystals that were left behind as the glaciers retreated. It was believed that spending a few hours underground in such caverns provided relief for respiratory problems. It was discovered back in the 1800s when it was discovered that salt mine workers in Siberia suffered from far fewer respiratory problems than their contemporaries. You can now find such salt caves, and even simulated salt caves, all over Europe. There are now a few of them in the United States too. It’s a therapy known as speleotherapy or halotherapy, which means “dry salt aerosol inhalation therapy”. Companies created a device called a slat pipe inhaler to replicate dry salt inhalation. These are hand-held devices that contain special dry salt crystals. You inhale through the mouthpiece, and exhale through your nose. You may also choose to purchase a salt crystal lamp. These lamps are said to release salt ions in to the room during operation. There are other salt therapies including drinking salt solutions made using special salt crystals and saline nebulisers. They create a fine mist that is breathed in through a tube attached to an ultrasonic salinizer device. Each of these devices has supporters that claim to have found relief through these machines, with some claiming they were even cured of their problems. But Does This Salt Therapy Actually Work? If you were to search online for testimonials about salt therapy, whether you look at salt caves, pipes, solutions, lamps or nebulizers, you’re going to find there are thousands of stories of people who claim to have done away with pills and inhalers, and have found relief through salt therapy. Anyone would get excited reading that. Dr. Mehmet Oz, a guest on Oprah and now the host of his own TV show, says that the salt pipe is the most anticipated alternative treatment he offers. If you look at his website however, you’ll notice there are no mentions of the salt pipe. So there is no telling how accurate that really is. Apparently Russia has already approved halotherapy, but the National Health Service of the UK, along with Asthma UK, are yet to endorse it. In the US the FDA has given the Himalayan salt pipe medical device status, but this does not mean it actually works. The New England Journal of Medicine published a study done in 2006 that suggests using a saline nebulizer is an effective additional treatment for people suffering from cystic fibrosis. The subjects used a nebulizer for 48 weeks. Unfortunately there is almost no scientific studies from credible sources proving these therapies work for the conditions they claim to, including allergies. While many of the websites selling these salt pipe inhalers claim there are studies that support salt therapy, none of them actually link to one. While they may not all agree it works, most experts do believe that salt therapy is at least safe. It’s a good option to choose if you’re interested in natural therapies. However salt therapy should be considered supplemental therapy and not an alternate therapy for traditional medical treatments. Salt pipes are also fairly inexpensive. They are generally sold for less than $50. While you will have to pay to refill the salt crystals the included salt crystals should last you for a month or two. We recommend Sailtair which is certified as a Class I Medical Device. This salt pipe has been highly praised by a number of health professionals worldwide. For more information read Salitair review. If you’re interested in trying a salt pipe inhaler or another variation of salt therapy then it’s worth talking to your doctor. It’s likely going to be safe to do, but you shouldn’t throw away your inhaler or pill bottle right away. See what the results of the salt therapy are first. If you find that the therapy alleviates your symptoms then set up another meeting with your doctor and discuss changing your treatment plan before making any decisions on your own.